I love to watch leaders grow! It’s fun to see someone take their first steps into leadership. Leadership is a choice, a choice that more of us need to take. At home our children need parent leaders. At school, our children need teachers and administrators to offer clear direction and coaching. 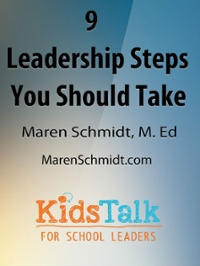 Here are some Kids Talk articles that focus on parent and school leaders to help as you choose to lead and manage your family, school, or larger community. Click on each title below or download your eguide below. 9 Leadership Steps You Should Take.